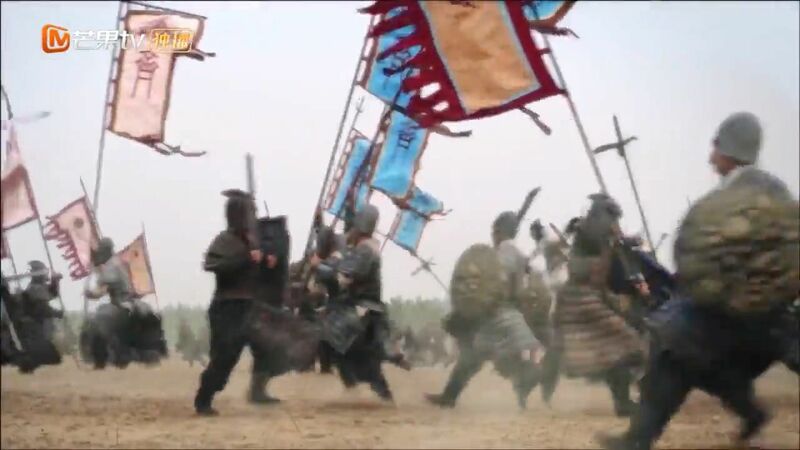 Qi and Zhou armies are camped outside Wu Shan city. Lu Guang wonders what Yu Wen Hu is up to now, doubling back on his plans. But whatever it is, the Qi side are also prepared for them. If Yu Wen Hu is to retreat, they have already stationed a small army there to intercept them. Suffice to say, both sides are out for blood. Yu Wen Hu alone comes forward, and Chang Gong joins him in the middle. Yu Wen Hu reminds him that the city is right at Zhou’s border and must remain theirs. 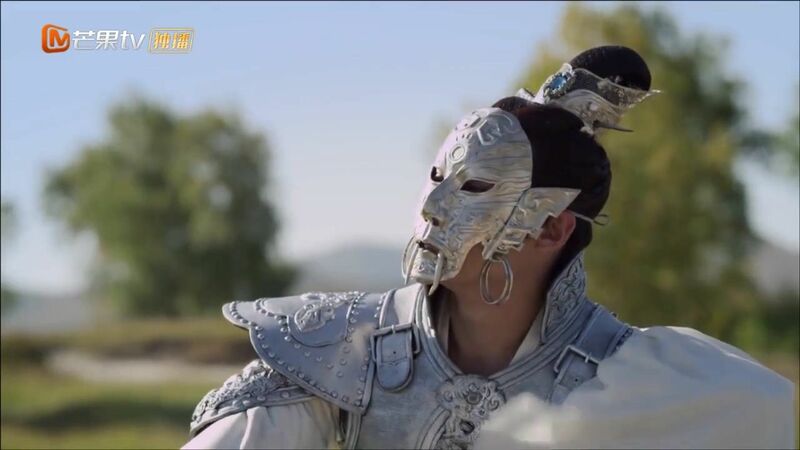 He wants Chang Gong to retreat to prevent unnecessary suffering for the people, but Chang Gong retorts it is Zhou who has been relentlessly pursuing Qi. Both leaders give the signal to strike and men rush at each other. Meanwhile, not far away from the warzone, Qing Shuo is battered from her long journey to find the elusive Jie You flower. She settles down on a rock and proceeds to fall asleep there. Back at the warzone, Yu Wen Hu calls for his men to retreat. They head towards the gates, until they find it closed. Yu Wen Yu signals his men to the other side instead. 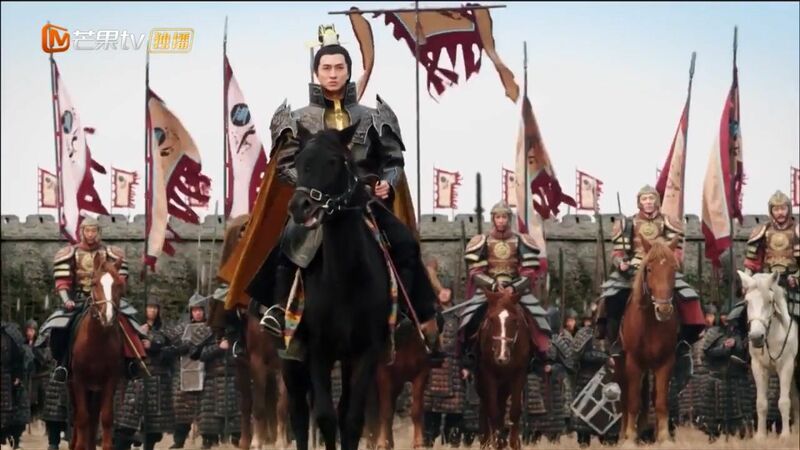 But before Chang Gong can give chase, his horse throws him off and runs away. The horse must recognise Qing Shuo, because it finds her there. Only now, she wonders how she should get to Qi with a war ongoing. The horse is good timing though, so she climbs onto it (while being surprised she knows to ride one). On a new horse, Chang Gong chases Yu Wen Hu’s men until he decides it is too dangerous to follow. Just then, Lu Guang alerts him to the sight of his runaway horse, who is carrying Qing Shuo. He is so stunned that he wonders if it is Xiao Lian —Qing Shuo’s real name is Duan Mu Lian, if you remember (for the sake of clarity, I will continue to refer to her as Qing Shuo). Qing Shuo is freaking out on the horse who won’t listen to her, even as she pleads that it is riding straight into the warzone. It runs into the Zhou soldiers and when the men attack her, she falls off the horse. It sparks Chang Gong to go and rescue her. With the leader of Zhou army charging straight into the enemies, with Lu Guang and his men following closely behind, a second bloodbath is initiated. Caught quite literally in the middle of a war, Qing Shuo runs like a headless chicken trying to avoid soldiers from either sides. When a soldier attacks her, she barely avoids it. She spins and spins out of safety, with her hair loose around her for dramatic effect. 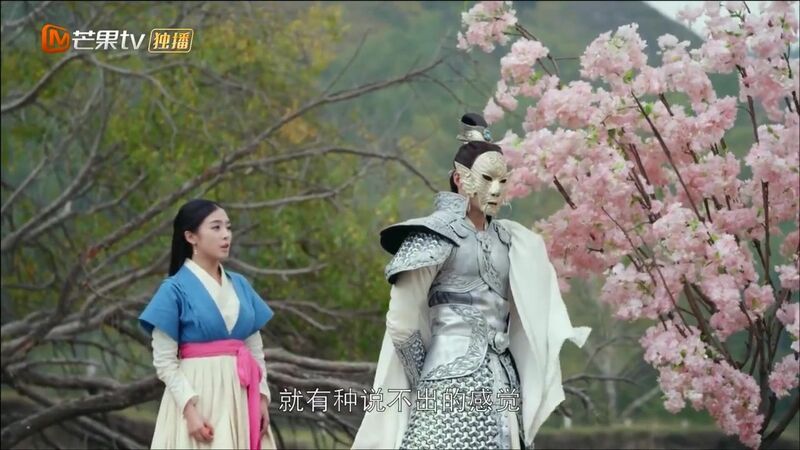 Chang Gong is of course watching this, and he remembers how their romantic stargazing date has ended: he was caught off guard while attackers shot an arrow at Qing Shuo. Injured, she has fallen off the cliff before he could save her. Back in the present, Qing Shuo is forced to defend herself by stabbing another soldier. Thanks to Lu Guang, he snaps out of his trip down memory lane just in time to counter the soldiers who are trying to kill him. He also saves Qing Shuo, who just stands there, obediently following the Damsel in Distress number one rule. They stare at each other for a moment, until Qing Shuo belatedly realises to defend herself and tries to hit him. He stops her hand, and then pulls her close, staring at her. She thinks to herself that the mask is scary, but the embrace (as she leans into him in apparent dizziness) is familiar. Then she faints. 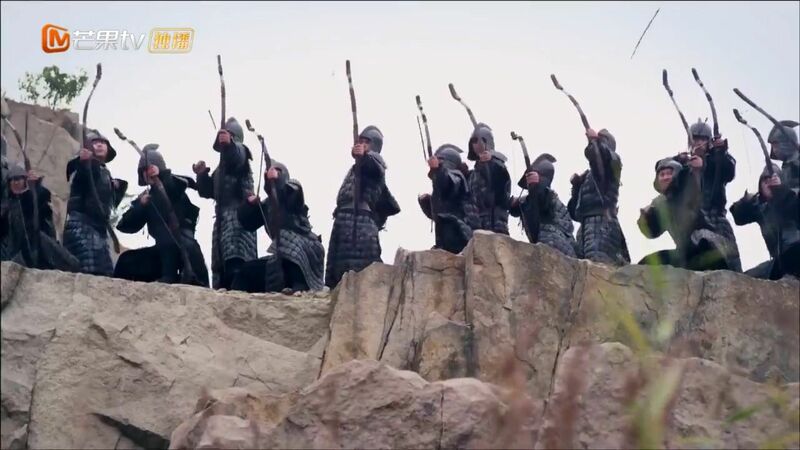 With Chang Gong and his men exactly where he wants them, Yu Wen Hu orders for his men to blockade the area. Without concern for his fellow men who are still fighting off the Qi soldiers, he calls for the release the arrows. When the Zhou soldiers band together to protect Chang Gong, Lu Guang is surprised to see it is Xiao Lian, though he notably doesn’t call her by name. Chang Gong orders him to take Qing Shuo out alive and he agrees. Meanwhile, Yu Wen Hu and his generals all mock Chang Gong for hiding, taunting him to either fight or surrender. Chang Gong alone knocks down the makeshift stone gates Zhou used to blockade the mountain, allowing his men to escape. Yu Wen Hu’s general wants to give chase but he knows it is too late. 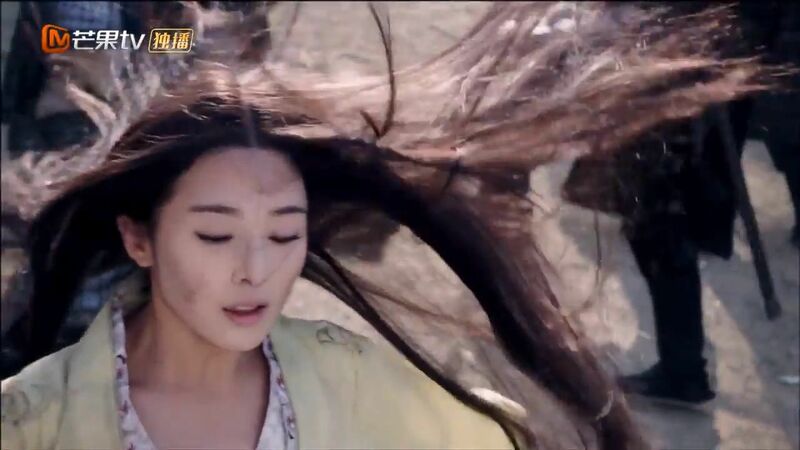 A worried Luo Yun paces as she waits for Chang Gong and Lu Guang to return. 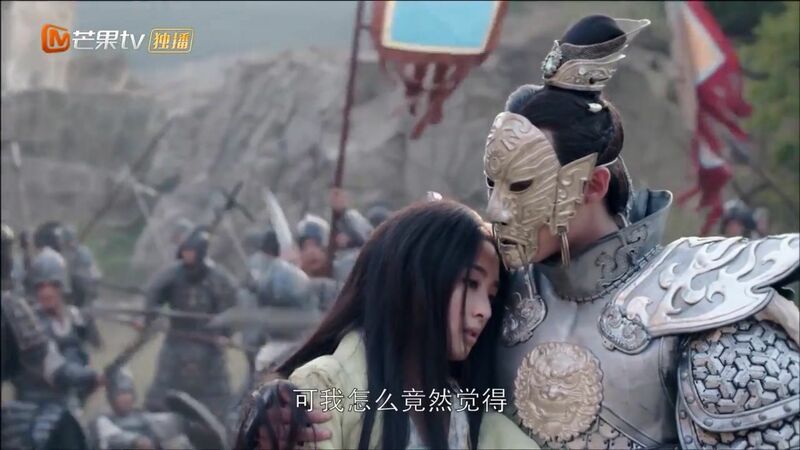 When the Qi soldiers finally make it back to their base, it is with Chang Gong carrying another woman in his arms. Luo Yun too recognises Qing Shuo, but Chang Gong barely acknowledges her, focused on settling down Qing Shuo. The maid wonders if it is Xiao Lian really came back to life, or if their eyes are obscured. She voices out what Luo Yun must be fearing: Xiao Lian has been childhood friends with Chang Gong, where would that place Luo Yun? Lu Guang soothes her fears: “She is not Duan Mu Lian. 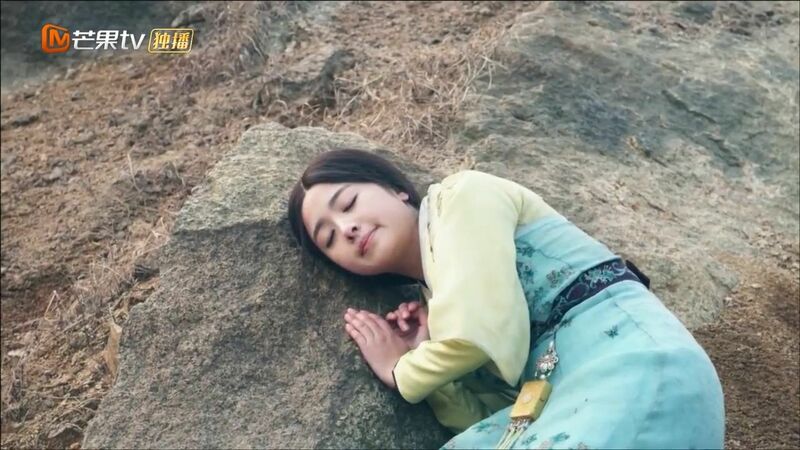 I was there when Chang Gong found her corpse.” Since they have already confirmed Xiao Lian’s death, the fact that Luo Yun is the future Princess of Lan Ling will not change. His words do calm her. Chang Gong is without Lu Guang’s conviction, as he stares at the sleeping Qing Shuo. Luo Yun offers to clean Qing Shuo’s face, calling her “that miss.” Chang Gong seems to take offense at that but allows it. Only when he leaves though, does Luo Yun betrays her anxiety over the young woman who looks so much like Xiao Lian. While she is attending to Qing Shuo, she suddenly wakes. Luo Yun fills her in on what has happened and confirms that Qing Shuo really doesn’t know Chang Gong. Qing Shou learns about her saviour, Prince of Lan Ling. She thinks again that she doesn’t remember knowing such a person but wonders why his embrace is so familiar. Outside, Chang Gong is with his treasured horse, which has never done anything wrong. He wonders out loud if the horse wants to bring Qing Shuo back to his side. Could it really be his Xiao Lian? Flashback. Just as the lovebirds lean in to kiss, assassins attacked them. Chang Gong finds the seal of Zhou but his moment of distraction allows another to fire an arrow at Qing Shuo. Like what we have seen earlier, she falls off the cliff. What we didn’t see earlier was how Chang Gong has ordered his men to look for Qing Shuo for days. They do eventually come across a corpse but it looks to be beheaded. Lu Guang sensibly tells him that it might not be her, but Chang Gong is beyond despair because he recognises her ring on the corpse. If there are autopsies at this age, this entire drama probably won’t happen. Lu Guang finds Chang Gong and tells him he wants to save his men captured by Zhou. 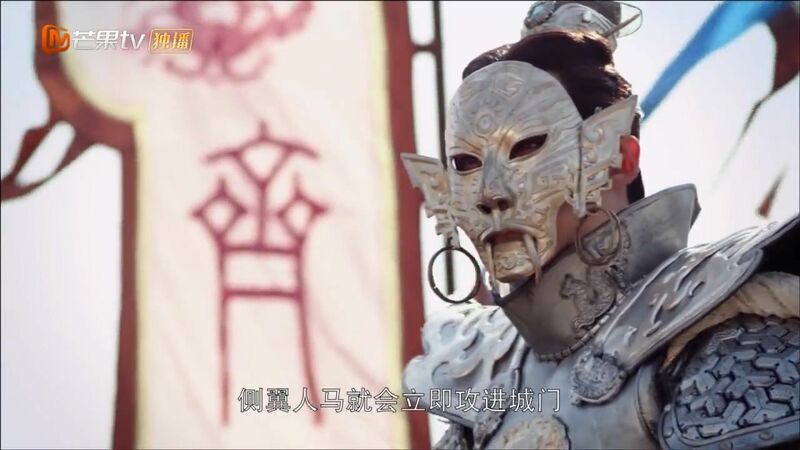 He knows Chang Gong doesn’t like to hear it, but he voices his suspicion of Qing Shuo’s appearance: “Don’t you find it strange that she can run straight into the battle and leave unscathed?” That is what I’m saying. He thinks that if it really is Xiao Lian, she would have recognised him immediately. Instead, she looks to be someone who looks like Xiao Lian, sent by Zhou to wreak havoc. 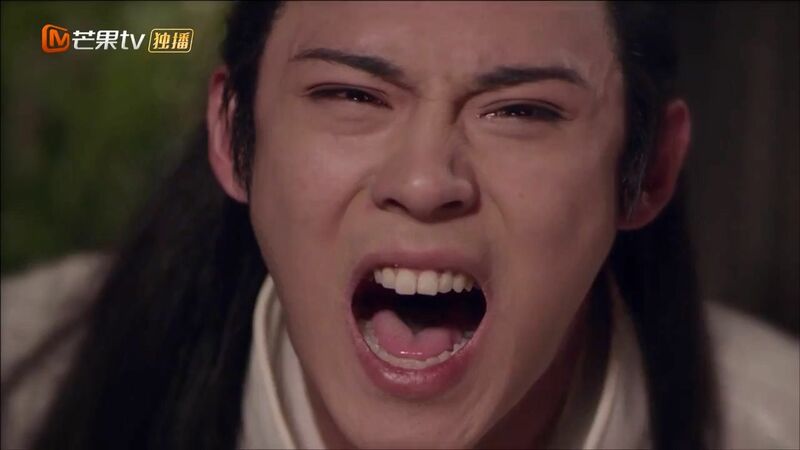 Lu Guang repeatedly reminds Chang Gong of Xiao Lian’s death, before storming off. 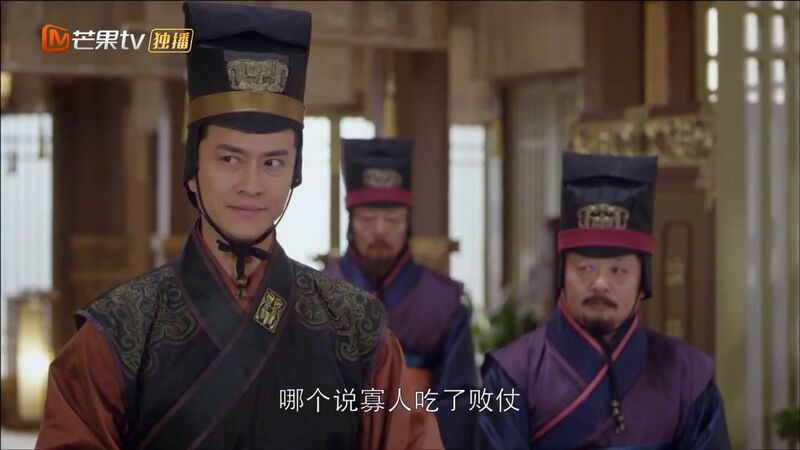 When he sees Qing Shuo approaching, he looks decidedly unhappy. Qing Shuo introduces herself with her adopted name and praises the horse being a good one, for saving her. She then corrects herself, thanking Chang Gong instead. 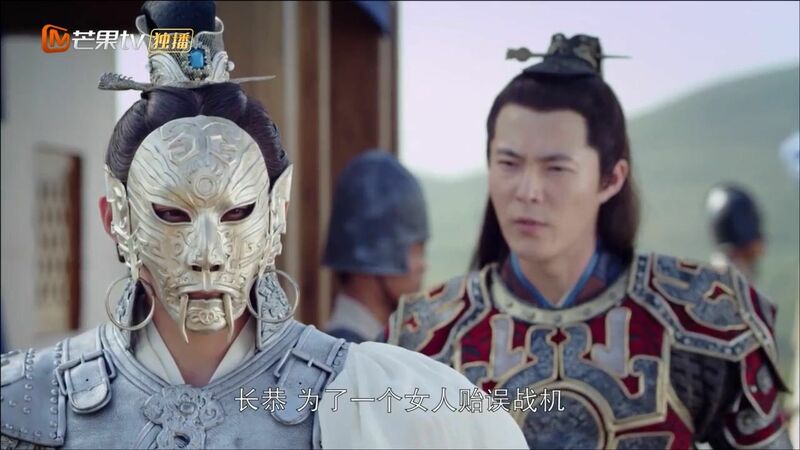 For a tense moment, Chang Gong stares at Qing Shuo, wondering again and again if it is his beloved. She too, is not immune to the dejavu, and wonders why his eyes are so familiar. 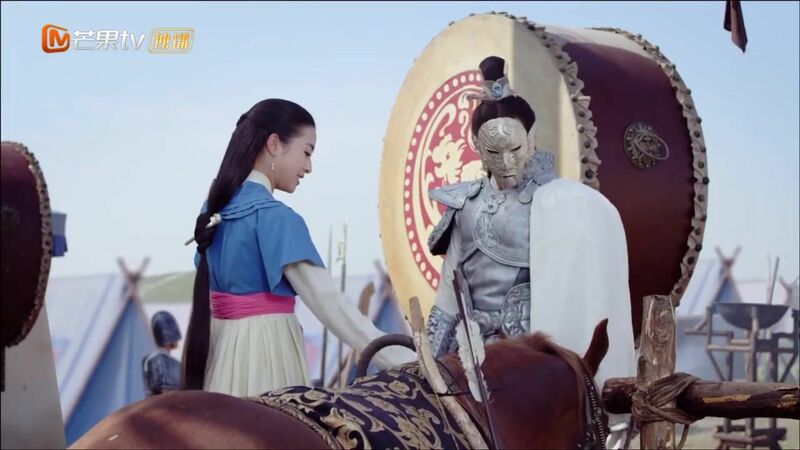 When the horse neighs, it jolts them out of their reverie and it finally prompts Chang Gong to ask after her injuries. Sensing how much his horse likes her, he asks if she is interested in riding it. So off they go to frolick in the nature, while Lu Guang helplessly yell after them, lol. Lu Guang wants to chase them down, but Luo Yun stops him from doing so. He tells her this is not only because it involves her, and he is right of course. But Luo Yun just says she trusts Chang Gong can differentiate reality from fantasy, except her eyes don’t sell that sort of conviction. Qing Shuo is so happy to be out in the fields that she quotes a song. 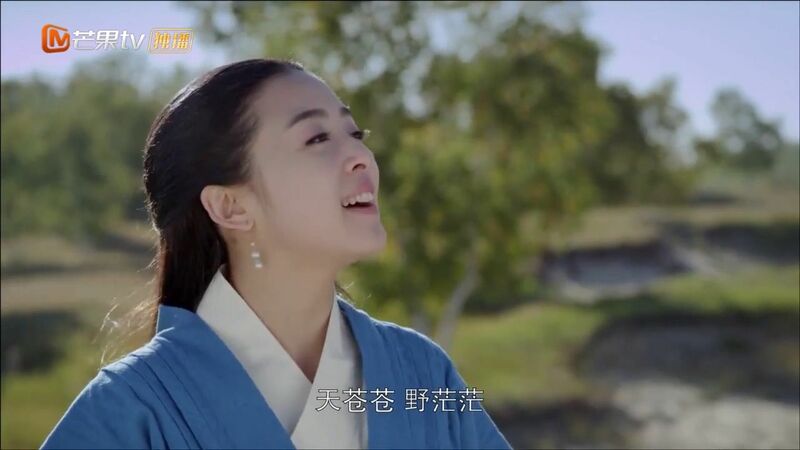 Chang Gong notes that she looks like she is from the South and wonders how she knows the song. She tells him that she lost her memory and she doesn’t even know if she is from the North or South. The song just came up in mind, that is all. She wonders if she is here before, because it looks familiar to her. She lies down, sick and tired of not remembering anything. Chang Gong comforts her, telling her that it might not be a bad thing to forget everything. She asks if he has any worries but then decides that since he is the God of War and Prince of Lan Ling, loved by all, he must not have any. He asks her if she has a choice, what sort of life would she live? Qing Shuo says it could be anywhere: “as long as I am with the person I love.” Surprised, he asks if she has someone but she says maybe, don’t remember. 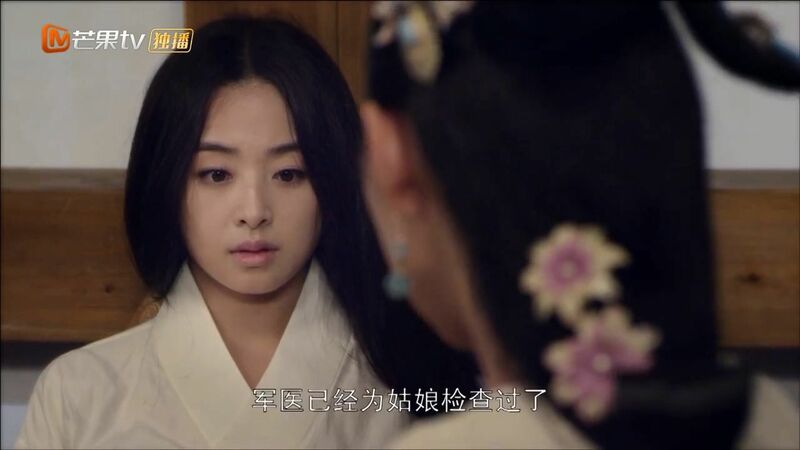 Chang Gong watches her longingly, telling her that she really looks like her… before snapping out of it. His reaction alarms her as well, and she hurriedly clarifies that she means nothing. But then she spots a flower, and it reminds her that she is looking for Jie You flower. He points out that the flower in front of her is indeed Jie You flower and hands her some. But it looks nothing like the one in handkerchief and she spaces out, wondering if she saw wrongly or if Yan Wan lied to her. He goes hunting for their meal next, finding a rabbit. 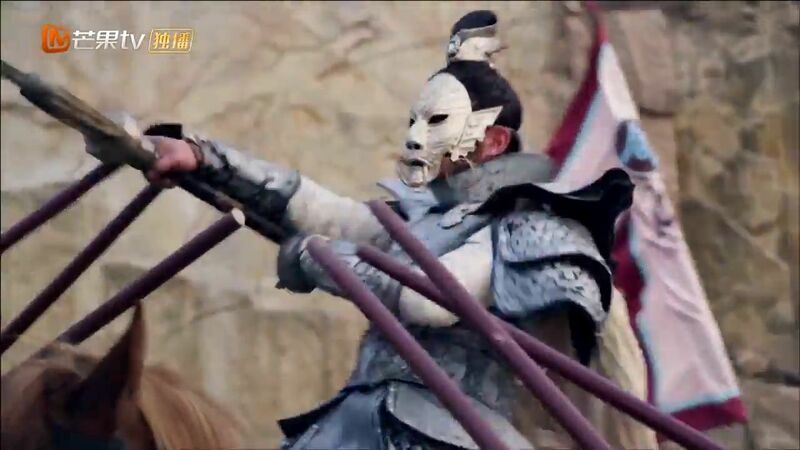 Qing Shuo decides to fool around and pretends to be a prey, prompting him to aim his arrow at her. 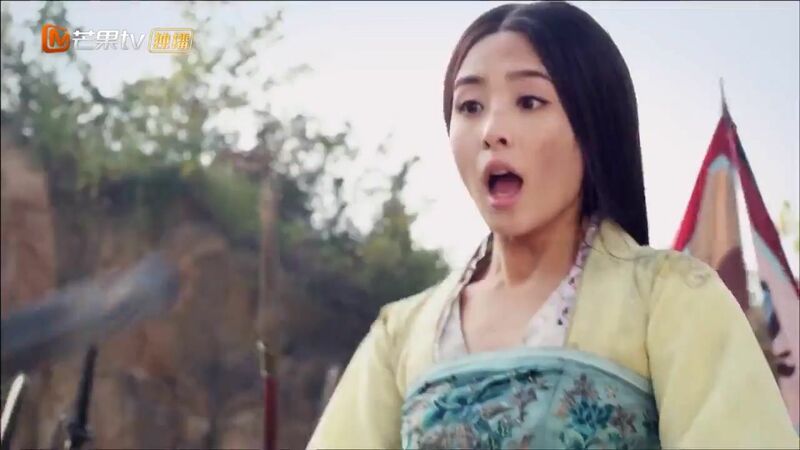 Frightened, she takes a step back and Chang Gong has to swoop in to save her from falling for his trap. The close proximity affects them both, and for the nth time, she wonders why his embrace is so warm. When they rest by the river, Qing Shuo picks up a dandelion that Chang Gong has flown down stream, putting it in her hair. 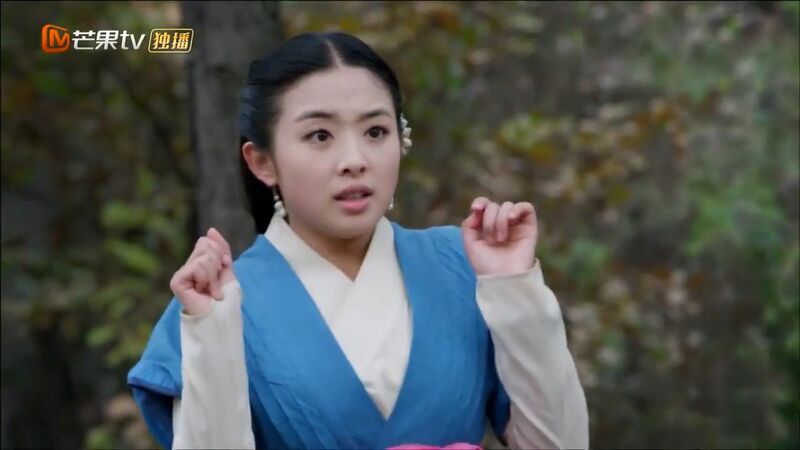 She then asks Chang Gong if they can release the rabbit. He agrees and they dine on fish instead. That prompts another memory of their childhood years, where Qing Shuo and Chang Gong caught a fish after much difficulty. Back then he was already a little player and gave her a dandelion, which she placed in her hair. He asked if she really likes fish and promises he will catch it for her forever then. 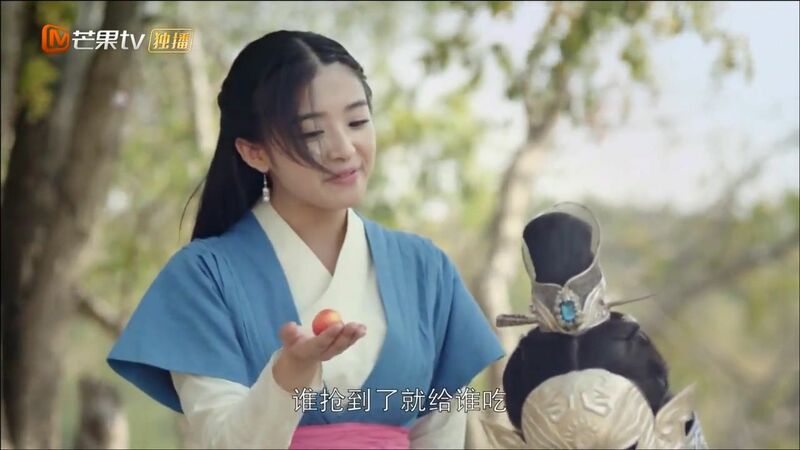 Present day Qing Shuo praises him for his skills in fish catching and happily shows him a fruit she found. But too bad there is only one. Her solution? Toss it up the air and whoever catches it get to eat it. Chang Gong is ignoring her but she stubbornly persists anyway. The fruit disappears, stuck on a tree branch. She is determined to get it though and throws a stick. She flinches when the stick falls, and he has to step in to save her. Again. The fruit in his hand, Qing Shuo insists it is his now. But he gives it to her anyway. She eats it, happily proclaiming that it is the best fruit she tasted. Watching her, he accidentally breaks the stick he is holding and she worries over his injury. For no obvious reason, it prompts her to remember her purpose here: to find her memory. She tells Chang Gong she has lost everything now and he promises to help her. She is clearly grateful and wants to repay him but there is nothing she could do for him for now, so he just asks her to start eating. She laughs that he couldn’t possibly eat still wearing the mask and when she tries to remove it, he stops her. She voices her curiosity, wondering why is he still wearing the mask despite being off the battleground. Is it because of his battle scars? She protests and explains that she only feels familiar with him, as if she is reuniting with a very close friend to her. 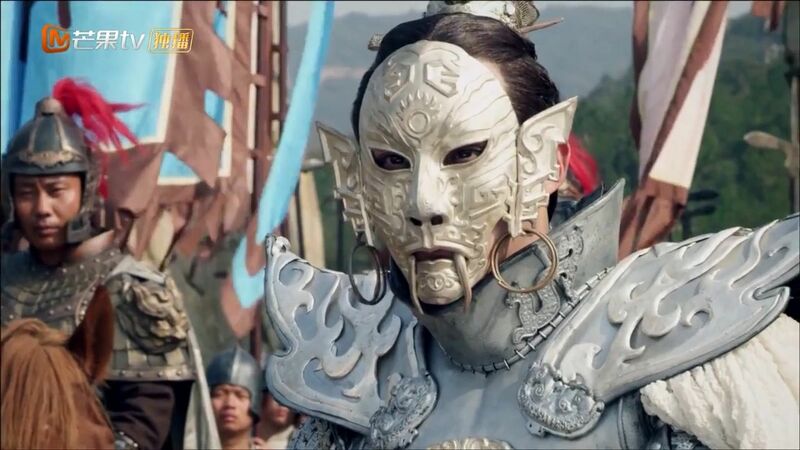 This answer troubles Chang Gong and he grapples between the truth he believes to be true and the past he longs for. In his mind, he wonders if it really the girl who promised to be his Princess. Yu Wen Hu reports that the captured Qi soldiers are being dragged into the city and rips into the officers calling his expedition a failure. The Emperor is not all that convinced that it is a victory, but Yu Wen Hu says that at least they have entrapped Chang Gong and nearly killed him. 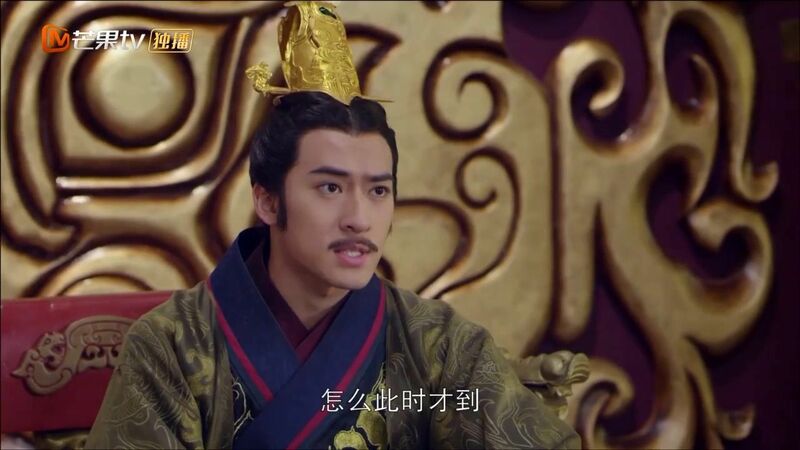 Basically some court shenanigans that show Yu Wen Hu’s influence and how he still largely controls the court, pressuring the fledgling new Emperor. Ryu: I am convinced Qing Shuo not only lost her memory, but also about 80% of her reasoning and common sense. I understand the show wants to focus on her naivety and innocence but this is really stretching it. I constantly wonder if I am watching a grown young woman or a five-year-old child. Her innocence is borderline stupidity and I went from rolling my eyes (“What?”) to actually being annoyed (“Stop”) to just acceptance of whatever stupidity that she is up to (“This doesn’t make sense but okay”). I fully understand where my problem stems from, though: this show does not hold up under careful scrutiny. When you turn off your brain and watch it as it is, it is entertaining enough and the pretty is enough to distract you. That was how I marathoned the first six episodes, I actually really liked it. Even when I read the comments that warned of an upcoming iceberg sinking my ship, I still look forward to Chang Gong scenes. And I still do now, because Chang Gong is what keeps me sane watching this show. I take what I said last episode back! If they are gonna wipe her memory, at least let her stay with Yuwen for a bit before sending her back to Chang Gong. Because now, she will surely love him first again. And then what? Swing her back to Yuwen to even out the shipping scenes? Lol. Thanks Ryu! Sorry for the loss of our collective brain cells. I feel so lonely bc I’m on the yuwen’s ship. T_T I do think he’s a bit aggressive and his expressions were a bit weird on their wedding’s night but after ep4…I’m definitely on this ship..i guess some can be turn off by his “push and pull” ways but I love how he’s falling for her and he doesnt even know it and acts this way. I like how theyre always bickering but i do wish they tone down the aggresssive part just a bit. I don’t mind lanling either. Obv the character fits the actor well. I think they’re cute too but my problem I guess is they’re already in love with each other and even with her memory loss she already fallen for him bc the familiar feeling. For me I do like to see how they end up liking each other. Sigh my fav scene so far is definitely how the almighty yuwen was so scared of the puppy or as she said it “smol” puppy haha. eyoungieee, I’m with you on the same ship! It’s a lot of fun watching QingSuo and YuWen provoke and challenge each other. He might be on the aggressive side but as a character, it’s much more believable for him to be suspicious of her. They have moments when it gets really hostile and others that are funny and almost heart-warming. I’m definitely a fan. As for the brain cells, no comment. Plot wise those, no matter what “stupid” choices she makes, there’s something about her fearless. It’s when she starts to learn to fear loss that she’ll no longer be a child. And half the fun will go out the window. For now, I’ll be enjoying the ride and beautiful costumes and scenes! i also suffer brain cells loss from the things she do too. there’s a difference between being fearless and being plain stupid. lol. unfortunately, she falls under the latter. the show can still be fun and have our female lead at least functional with common sense. More Yuwen Hu and Qin Shuo scenes coming up in subsequent episodes. I think Qin Shuo will eventually fall for Yuwen Hu and be conflicted when her memories return. She probably will sacrifice herself to protect Yuwen Hu from Langling Wang. The more I look at Chang Gong, the more he looks pretty handsome (not manly handsome but pretty/beautiful handsome type)- absolutely fitting the historical description of him. It’s because he’s beautiful handsome that he needed the mask to scare his enemies coz ppl will just laugh at such a pretty face leading an army and the army themselves probably will not have confidence following the orders of a pretty boy! After catching up on the episodes I agree her character at the moment is annoyingly stupid. I didn’t read the novel but I think the overall story would have been better if they started her amnesia at the beginning like her waking up the morning after her wedding with no idea of her identity and did flashbacks of what happened before and the night of the wedding from Yuwen point of view because then as an audience we would have been engaged to see her development of her feelings of both male leads. OMGOMGOMG! I was waiting for that umbrella scene!! What to do?! hi Kappy, Will you be doing more recaps of this show? It’s so addicting. The title of this drama is misleading or is it not? I googled and found the original title was princess of orchid hills but i guess they want to milk the name since many of them are newbies? I am enjoying it but I’m just confused as viewers are probably asking why yuwen gets more screentime so far. I know everyone been saying she eventually fall for him and by the scenes and interactions he gives me vibe that he sorta the lead but still maybe he’ll still be second lead? Its nice of him letting her to lan ling. Anyway it looks like this week we’ll be focusing more on lan ling as she get sent back to him. So maybe second half more on him but its just feels odd bc yuwen gives such that tsundere male lead feel. Cold and mean to her but silently protecting her. *swoon* ill make up who ill ship more when lan ling gets more interaction with her this week to even it out haha. Btw the main actress is so cute that i forgive her stupidity at times haha.